There’s no doubt about it, Darwin people love their dogs. 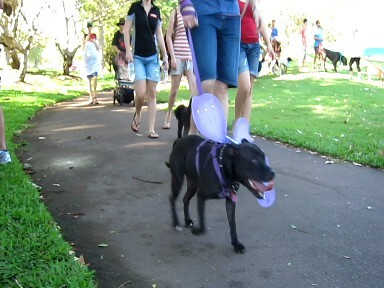 There’s more than 7500 dogs registered with the Darwin City Council; that’s about one for every two families. 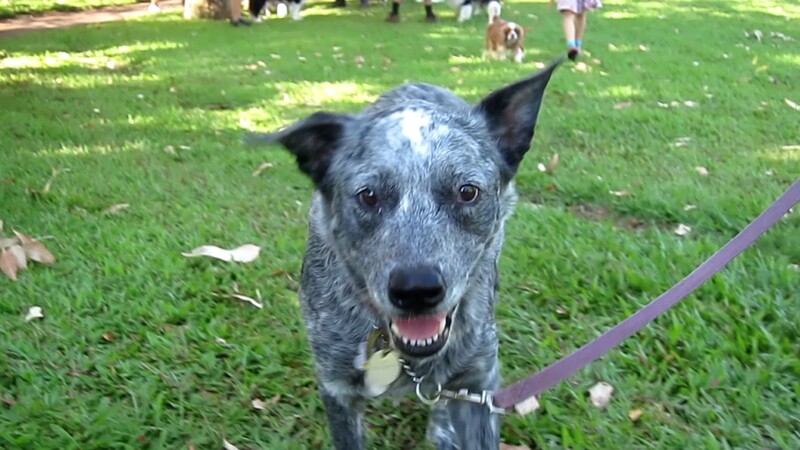 And on Sunday there was a special walk in the park for hundreds of Darwin’s favorite pooches. More than 370 dogs and their human companions took part in the annual One Million Paws Walk at the Jingili Water Gardens, raising nearly $35 000 for the local RSPCA. Reporter Lyn Allen was at the finish line, and talked to Richard and Grace. Dogs (and their friends) came in all shapes and sizes. Every year the Darwin RSPCA animal shelter helps about 2500 animals. One Million Paws Walks are held across Australia. In Victoria, sponsors donated about $250 000 to help care for abused and abandoned animals, while in NSW walkers raised over $130 000. For a fabulous report about the Geelong walk, visit Guryel Ali’s blog site. Learn more about the Darwin RSPCA. Lost a pet in Darwin? Try looking here. Last month a new exhibition of contemporary art by Australian women opened at the Gallery of Modern Art in Brisbane. Local Darwin photographer/artist, Therese Ritchie, is included in Contemporary Australia Women which features emerging, established and senior Australian women artists. Well known in the Top End, the GOMA exhibition exposes Ritchie’s artistry to a national audience. Senior Curator, Exhibitions and Research, Miranda Wallace, writes in the exhibition catalogue: “Ritchie’s interest in generating social, economic and political reform is at the core of her work, but her images are not those of a dispassionately analytical ‘straight’ photographer”. In this interview Ritchie talks about her reaction to the invitation to participate in the GOMA exhibition and about her experience of working on the streets of Alice Springs. Ritchie has undergraduate and graduate degrees in fine arts from the Charles Darwin University. Curator of the University’s art collection, Anita Angel says that Ritchie’s work is “beyond photo-journalism or biographical documentary” and “goes where other image-makers of the Northern Territory frontier have rarely dared to venture: into a heart of darkness of our own making”. Listen to Sarah Kanowski interview Therese Ritchie on Radio National’s Weekend Arts program. See Therese Ritchie’s portfolio and floor talk at GOMA. You can visit the Contemporary Australia Women exhibition at the Gallery of Modern Art in Brisbane until 22 July 2012.